Although it is now centred on Croydon, the A.B.C. was formed in Anerley in 1881. It sprang from a Hoop Club formed by a few young boys from Dulwich College who graduated to bicycles. The Club Runs of these pioneers started every Saturday from the Robin Hood pub at the bottom of Anerley Hill where it crosses Croydon Road, Penge (see here). They ventured forth back then on sandy, gravel or chalk roads. The sandy Brighton Road became impassable past Purley in dry weather. Nevertheless, these runs were intensely popular, with 85 members featuring on an October 1891 run. On other occasions members pushed their bikes through the snow rather than miss a run! 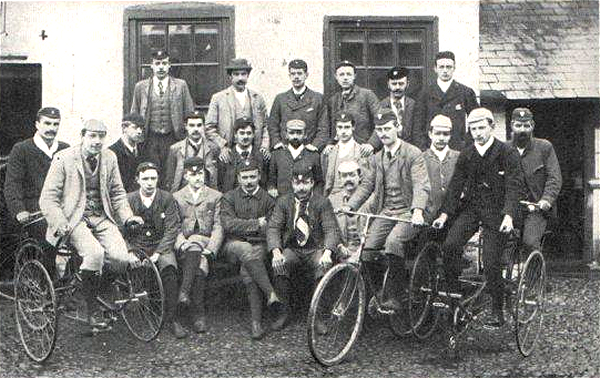 Its founding date, 1881, places it as one of the oldest cycling clubs in the World that have remained in continuous existence. Its first members rode ordinaries, or penny farthings. These were superseded by safety bicycles with two equally sized wheels and chain drive to the rear, much as the cycles of today. In the late nineteenth and early twentieth century, cycling was the prerogative of the gentry, and in 1893 for example, the cost of new machines in the Club was estimated at £1,000. This was a small fortune then, with the cost of a second-hand safety ordinary being up to £18. Club members wore uniform, and the Captain had a bugler who sounded the captain?s commands – very militaristic! In its heyday, the Club organised the famous “Anerley 12”, a time trial of 12 hours duration ridden by the top men in the country. One of the early members S.F. Edge once held the World Record for 100 miles, as well as winning the first ever Catford Cycling Club’s Hill Climb, in 1887 on Westerham Hill, riding a ‘safety’ cycle. As befits a club of such long history, it has a Latin motto: ?Palmam qui meruit ferat? The palm to him who deserves it. This features in the Club Gazette heading, below, which itself dates back to 1890 and depicts the finish of a safety race, an Olympia tandem tricycle and a man on a single tricycle, thought to be S.F. Edge. Until the 1960’s the Anerley was an all-male club. Females could become associate members with no voting rights and few other rights. The rule was amended in 1965 to permit women into full membership. At present, the Club’s President and General Secretary are both women and there are a number of other female members.